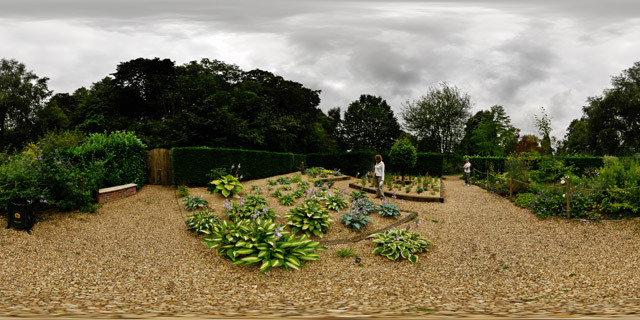 360° VR panorama of the Elizabethan Vegetable Garden in Barnsdale Gardens, Rutland, UK. The plants in the Elizabethan Vegetable Garden are planted close together to maximise the available soil usage. Flowers are also grown alongside the vegetables, making the garden look less strictly utilitarian. All the gardening can be done from the pathways, removing the need for standing or kneeling on the soil when tending the plants. 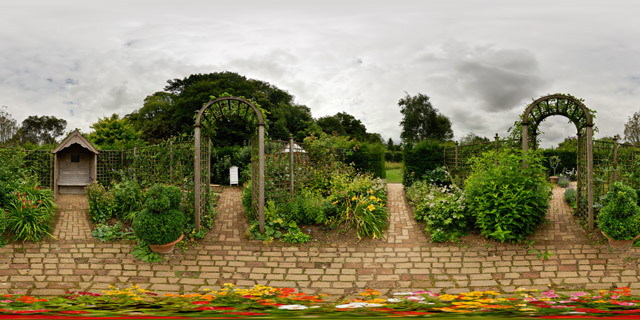 Barnsdale Gardens in Rutland, England were made famous by Geoff Hamilton through the BBC television series Gardeners’ World which he presented from 1979 until his death in 1996. They are situated on The Avenue in the parish of Exton, a short distance north of Rutland Water. Geoff Hamilton began developing the garden in 1983 from what was then a ploughed field. It now covers 8 acres (3.2 ha), comprising 37 individual gardens and features. 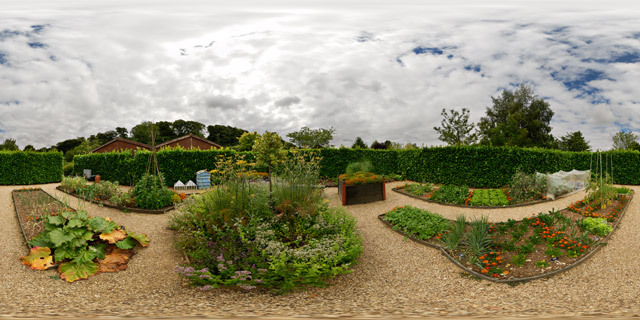 360° VR panorama of the Ornamental Kitchen Garden in Barnsdale Gardens, Rutland, UK. Originally built for the television series ‘Ornamental Kitchen Garden’, this garden features both vegetables and flowers growing side by side. The television series was first shown in 1990, and was made to promote the idea that fruit and vegetables have ornamental value, as well as being edible. The plants in the Ornamental Kitchen Garden are cropped regularly, and so a well thought out planting schedule is very important. People often find it difficult to separate the ornamental and edible plants in the garden, which is testament to the design of the garden and the choice of plants made. 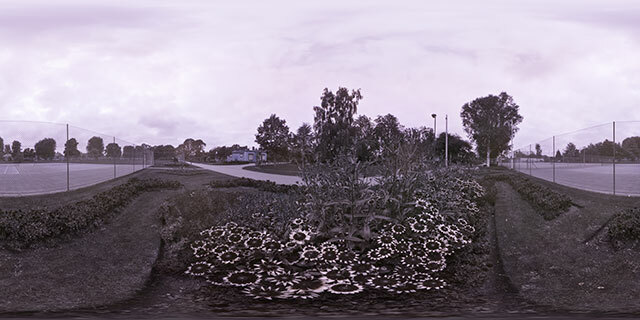 360° VR panorama of the Hosta bed and Penstemon bed in Barnsdale Gardens, Rutland, UK. The Penstemons are planted in a raised bed to allow good drainage, something that the natural heavy clay soil of Barnsdale Gardens does not provide. As well as the Penstemons, a large variety of Hosta species / cultivars are planted in the larger bed of this garden. 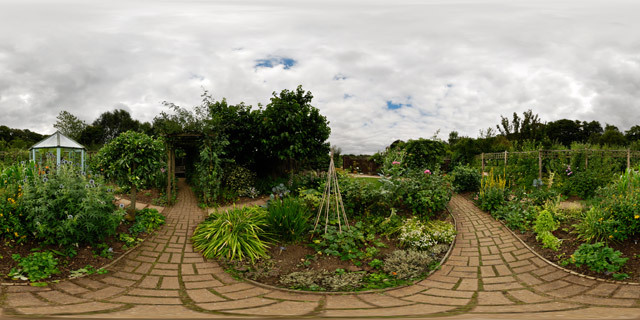 360° VR panorama of the Gentleman’s Cottage Garden in Barnsdale Gardens, Rutland, UK. The garden was built for the BBC TV series “Geoff Hamilton’s Cottage Gardens”, and was created as an example of how to deal with a garden that is wider than it is long. In 1995 the Gentleman’s Cottage Garden was recreated as the main feature garden at the Gardeners’ World Live Exhibition. 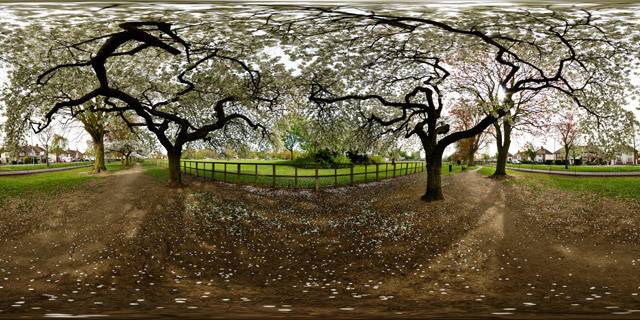 360° VR panorama of blossoming trees in Welland Park, a popular park in Market Harborough, England. Welland Park was awarded a Green Flag Award in 2007, 2008, and 2009. With the attention of hard working volunteers and council workers, the park helps Harborough consistently rank highly in (and occasionally win) the East Midlands In Bloom competition. 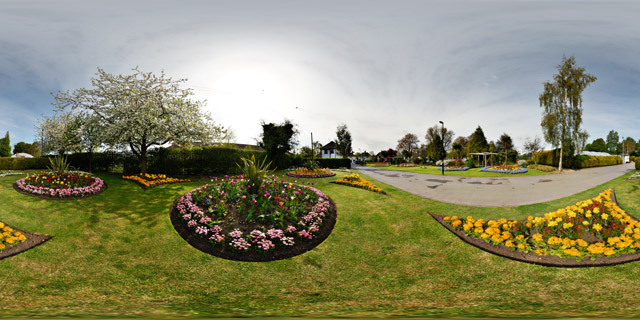 360° VR panorama of Welland Park, a popular park in Market Harborough, England. Welland Park was awarded a Green Flag Award in 2007, 2008, and 2009. With the attention of hard working volunteers and council workers, the park helps Harborough consistently rank highly in (and occasionally win) the East Midlands In Bloom competition.